There are two sides to every story and history, by far, is no exception. History is written by the victors. You know, “who lives, who dies, who tells your story,” and all of that. The film course I’m taking this semester is focused on the relationship between cinema and cities. What is it about certain cities or the general modus operandi of a city (instead of the countryside or a small town) that lends itself so well to film? Within that philosophical discussion, we have also been studying the phenomenon of divided cities. Watching films like “Goodbye Lenin!” this semester and “Atomic Blonde” this summer put Berlin at the forefront of this discussion for me. Other cities that have come up a fair bunch are Beirut, Lebanon and Jerusalem, Israel. I decided to study the city of Belfast, Northern Ireland. Right as the Berlin Wall was coming down, another one was going up in Belfast. In 1989, a “peace wall” was installed in Belfast to separate its Catholic and Protestant communities. This happened right in the heart of the Northern Ireland conflict, known also as the Troubles. The conflict started in 1968 and ended in 1998. While the wall I’ve mentioned came down in September, there are still 108 of them across Northern Ireland. Since 1969, only one other peace wall has been knocked down. There are four sides to this story. First, there were the unionists loyal to the United Kingdom. Then, there were the nationalists looking to re-unite with South Ireland. Next, there were the Irish Republicans, who were violently defending Northern Irish heritage. And lastly, there was the U.K. government calling the shots and refusing to acknowledge the Irish Republicans. The walls come into play because the Troubles were about sociopolitical strife. They were built along cultural (and by extension geographic) lines of difference. Since the unionists took their social cues from England, they tended to be Protestant. Nationalists and Republicans, on the other hand, tended to be Catholic. As portrayed by a Northern Ireland Life and Times Survey, fondness for the United Kingdom really did operate along these religious lines. To put it into perspective, 85 percent of Northern Irish Protestants were in favor of remaining in the United Kingdom. Compare that with 22 percent of Northern Irish Catholics. Meanwhile, 56 percent of Northern Irish Catholics were in favor of reunifying with the rest of Ireland. Compare with 7 percent of Protestants. This survey was conducted in 2006, when the details of the Good Friday Agreement were still being ironed out and the Irish Republican Army had been active not long before. The journey to any semblance of peace and understanding was a difficult one. Bolstered by U.S. President Bill Clinton, British Prime Minister Tony Blair and Irish Prime Minister Bertie Ahern were hard at work in 1998 trying to come to an accord. It seemed as if there was a resolution on the horizon. But when the U.K. did start to acknowledge the Sinn Féin party and the Irish Republican Army, the Democratic Unionist Party pulled out of talks. David Trimble from the Ulster Unionist camp was the one who pulled it all together by proving, legally, that Northern Ireland had the right to decide its future based on majority rule. That’s when the Good Friday Agreement came about. Seventy-one percent of North Irish and more than 94 percent of South Irish voted in favor of it. The IRA were still active, though, even though the referendum had been supported by both sides. Unionists who were already shaky about negotiating with Sinn Féin were discouraged by the IRA’s behavior. Still, a compromise was reached: when the Good Friday Agreement was amended in 2006, Northern Ireland became co-governed by Ian Paisley of the DUP and Martin McGuinness of Sinn Féin. Before this makeshift harmony was achieved, there was a particularly tumultuous time of violence. And not just IRA-incited violence, as the dominant narrative goes. 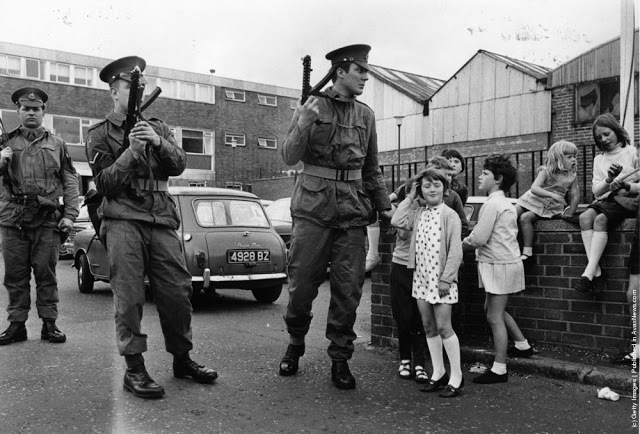 There was British state violence toward Irish folks as well. Her Majesty’s Prison Maze is a detention center known primarily as the holding cell of IRA paramilitaries during the Troubles. This is where Bobby Sands was held. Sands is a major figure in the Troubles, as he fronted a notable hunger strike in 1981. This strike was rolled out to once again put pressure on the British government to give the IRA political status. After 66 days without eating, Sands died. Nine other IRA prisoners also ended up dying over the next seven months. This starvation demonstration came among others, such as the “dirty protest” of prisoners sullying their cells with waste and the “blanket protest” wherein uniforms were refused in favor of blankets. All of these forms of resistance and Sands himself are examined in the feature film “Hunger,” directed by Steven McQueen. Released in 2008, it premiered at the Cannes Film Festival and stars Michael Fassbender. McQueen and Fassbender would later work together on “Shame” in 2011 and “12 Years a Slave” in 2013. Despite its gritty subject matter, “Shame” is a beautiful film. It is built on delicate details, carefully composed shots and thoughtful camera work that frames Sands’ quietly and actively agonizing existence. The ugliness of being a political prisoner is presented in such a pleasing way, so that you feel moved by the horrors you are witnessing. But McQueen strikes a perfect balance. While every frame, camera movement, nonverbal gesture and mix of sounds is aesthetically pleasing, the pain and suffering of IRA prisoners is never romanticized or overplayed. To complement “Shame” in my study of the Troubles, I also watched an episode of “Endgame in Ireland.” The four-part documentary deals with a completely different aspect of Sands as a political figure: his running for seat in Parliament. The film explains how Sands’ campaign for Parliament was run from the outside and how the IRA mobilized civilians to unite behind Sands as a candidate. Watching both of these films taught me a crucial point: that dramatized features and hard-edged documentaries both have a place in education. “Endgame” outlines the Troubles, the woes of the world outside and how Sands’ death seemed to set everything in motion. It gets its point across with voice-over, news footage and interviews. In comparison, “Hunger” is everything “Endgame” is not: intimate, deeply personal, highly specific and very concentrated. What would be a snapshot in a four-part documentary series is teased out for us to relish in and shudder at. Watching both films gave me a thorough and balanced view of the Troubles. I was able to get the sense of all sides of the story. I was able to develop empathy for all parties involved. Watching these films pushed me to learn more about this conflict and question what lies beneath the surface of what I had been told about the Troubles.